WASHINGTON—She should be in China competing to wear the Miss World crown on Dec. 19. 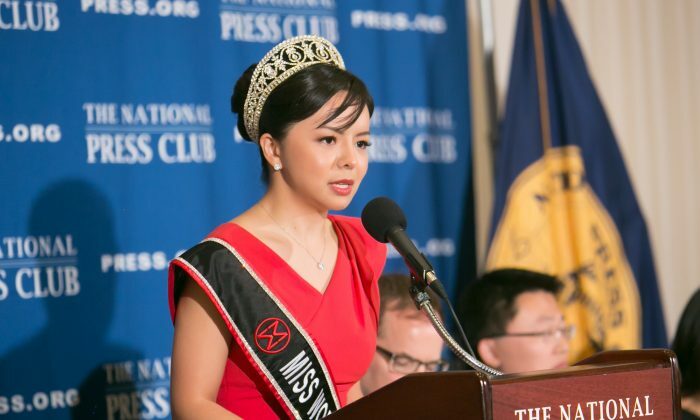 But the Chinese regime denied Anastasia Lin, Miss World Canada, entry into the country and declared her “persona non grata” ( a person who is not welcome) because she speaks out about human rights in China. “I entered the Miss World competition because of its motto: ‘Beauty with a Purpose.’ I believed that the competition might offer an even bigger platform for me to raise awareness of the issues I care about, and to promote the Canadian values of freedom and diversity that I treasure,” Lin said. In terms of what’s next, Lin said she is more likely to focus on her acting career now, given that 25 years old “is 70 in pageant age,” according to Lin. “Beauty pageants? I think I’m finished for now,” she said, though she may reprise her position as Miss World Canada to compete in the Miss World final next year, to make up for being denied entry on this occasion. Her new film, “The Bleeding Edge,” touches on the highly politically sensitive question of organ harvesting from Falun Gong practitioners in China. A member of the audience asked if that was why Lin was barred from China. It likely contributed to it, she said. At one point, Lin was asked about the Chinese regime’s campaign to slander Falun Gong. She responded that the Party leadership had come to see such a large number of individuals following a set of beliefs, which emphasizes individual moral responsibility, as a challenge to its social control. The increasingly tight relationship between Hollywood and China was also brought up. In recent years, movie studios have signed joint venture agreements with Chinese firms. Films with anything that could be construed as negative about China have been edited to fall in line with Chinese political sensitivities. On the other hand, there are some movie stars—Christian Bale, Harrison Ford, Richard Gere—who, like Lin, have also become personae non gratae.